Still a bit under the weather, but functioning and writing in slooooow motion, which is better than not functioning and writing at all I suppose. I’ve now left the laptop and switched back to the Moleskine as I will be on the road for the next few days. I know myself well enough to know that I’m more likely to open the Moleskine at an airport, or during a flight, if I’m working in the journal. A couple of interesting distractions today. 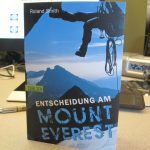 Here’s a copy of the German edition of my novel “Peak.” I always love getting these translations. Can’t read it of course, but it’s a nice edition of the book. And the final piece of furniture was put back into place this afternoon by three guys who were a lot stronger than they look. They made it look easy, but I wasn’t fooled. 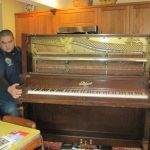 There is no way we would have been able to get this piano back where it belonged without mangling the newly finished floors. Marie and I head to airport at 3:30AM tomorrow for Reno. Prepping and packing tonight for the trip. that is a strange cover.why is it like that in a different country?